Wanna share your favorite songs with your friends by iPods? 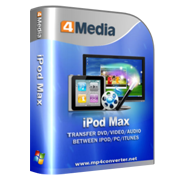 4Media iPod Max could help you transfer music from your iPod to another iPod or iPhone. 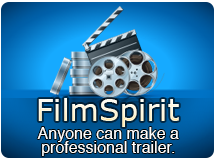 And you can also transfer movies, books, photos, ringtones, etc. between iPods with the iPod Max software. It's just so simple - what you just need is to connect the iPods to computer, drag-drop the songs as you like - that's all. 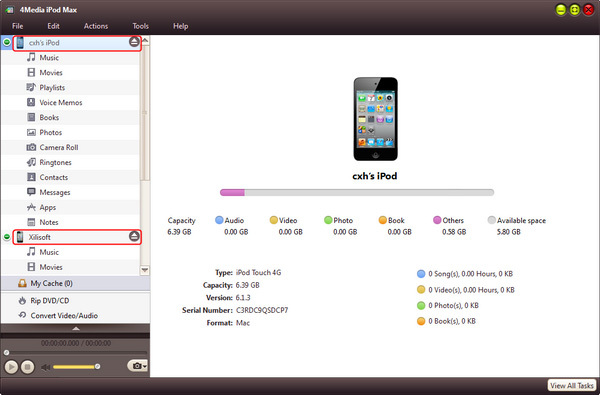 Ok, let's just see how to do it using this iPod transfer software. How to simply share music between iPods? Connecting both the iPods to your computer, and you will see 4Media iPod Max recognizes the iPods automatically and displays the device information on the software interface as picture below shows. 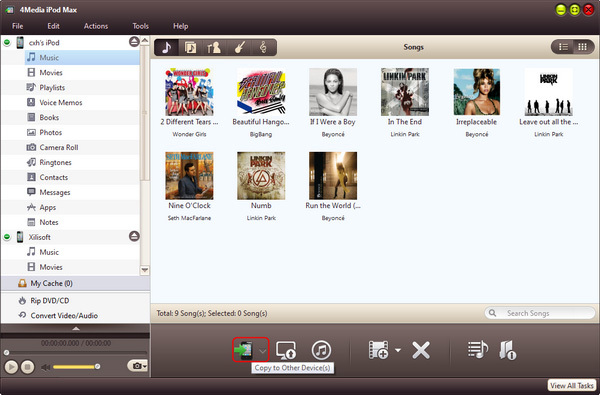 Check the songs in the source iPod and drag-drop them to the other destination iPod. Or click "Export Checked Files to Local Folder" drop-down button, then choose "Export to Other Device(s)…" option to start exporting the files. You can also right click the checked files and choose "Export to Other Device(s)…" option to start transferring the files to other iPod.